This morning I got an email from the datacenter that informed me of a loud alarm coming from one of my servers. I knew right away it was the LSI card sounding off due to a hard drive failure. Since I almost always use RAID 10 in critical arrays, I was more annoyed than concerned. So, off to the datacenter I went, new drive in hand. While diagnosing the issues, I realized there is no out-of-the-box way to be notified of a drive failure within ESXi. As far as I could tell, everything was fine, except for an audible alarm I would have never heard. The RAID card in this particular server is an LSI 9260-8i, however this guide is the same for all of the 92xx series cards, like the 9265-8i, or 9265-16i. VMware includes drivers for these cards, starting in ESXi 5.1 if I remember correctly. However, there is no health data for drives and no management interface for arrays. After a couple google searches, I quickly found that there is a lot of conflicting information and tons of problems that go along with installing the LSI MegaRAID Manager, MSM, on ESXi. I also ran into some problems. So, I thought I would put together a quick, easy, clear guide to save others the hassle of going through what I went through. So, here we go. To complete this process, you will have to put your ESXi host into maintenance mode, and you will have to reboot. So make sure your VMs are all shut down before proceeding. Enable SSH on ESXi Host. Copy LSI SMIS Provider to ESXi Host via WinSCP. Configure Host and Install SMIS Provider. Log into your host using the vSphere client, or the web interface, then go to the configuration tab and select Security Profile. Now, select Services Properties and find SSH. After selecting SSH, click Options and start the SSH service. Now go to Firewall Properties and make sure the SSH Server box is checked. This opens up port 22 on the host’s firewall. Under Services and Firewall, you will see Host Image Profile Acceptance Level. Edit this and change it to Community Supported. Now it’s time to enter Maintenance Mode. Click the Summary tab and at the very bottom you will see Enter Maintenance Mode. Open up WinSCP (or cyberduck or other program of choice) and connect to the ESXi host. In case you don’t know, SCP is a way to transfer files over SSH. Navigate to the /tmp folder on the host and upload the file called vmware-esx-provider-lsiprovider.vib. It will take a minute or two, and eventually it will install. If you get any errors make sure you changed the Host Image Profile Acceptance Level as done earlier, and make sure you included the ‘–‘no-sig-check at the end of the command. Also, make sure you are in Maintenance Mode. Once finished, you can close your SSH window and reboot the server. Once rebooted, if you open the vSphere client and go to Configuration > Health Status, you should now see a Storage category with your physical drives and arrays listed. On your Windows virtual machine, we need to edit the hosts file. Right click on Notepad and select “Run as Administrator.” Click File > Open, and navigate to your hosts file, which can be found at c:\windows\system32\drivers\etc\. You will need to select “all file types” to be able to see it. Add the IP address for both the hostname and the FQDN of your ESXi host. Now you can install the MegaRAID Storage Manager on your Windows virtual machine. 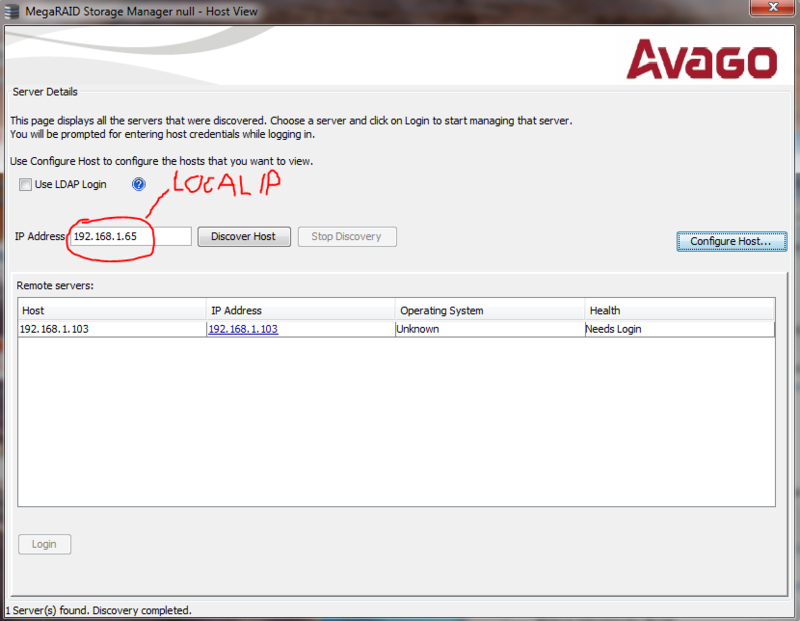 It needs to be on the same local network as your hosts management ip address. After you have installed MSM, open it and click “Configure Host.” Then, select the checkbox that says “Display all the ESXi-CIMOM servers in the network of local server.” Save Settings. Enter the IP address of your ESXi host into the IP Address field in MSM, and click Discover Host. It should eventually show up below in Remote Servers, where you can click Login, and login using your ESXi host credentials. Once you login, you are good to go. It will take a few seconds, after clicking login, before MSM opens. Don’t be alarmed, the lag is normal. That’s it. Its a fairly painless process, if you have the right information and steps at hand. Comment below if you have issues and I’ll do what I can to help. Hey. I can see my sensors and everything but I can’t see the host? I followed this on my VMWare ESXI 6.0 Update 2 server at home at it worked 100%. I had spent awhile trying to figure out a way to get this working but was unsuccessful. This guide was awesome thanks so much. Never Mind, apparently it was waiting on a reboot. which solved that. When in doubt, reboot! Glad that took care of it for you and I’m glad you were able to find some use of the information here. Thanks! u rebooted the esxi host or the msm server? after you rebooted, does it still show 127.0.0.1? Thank you! I will update the link on the post. I’m using esxi6 and the latest SMIS and MSM. Using your guide I set everything up and it was working fine for the last month. Then I moved the server to a new network, now MSM is unable to discover the esxi host and I get the dredded “Servers could not be found beacuase server may be down…” nothing changed as far as IP’s, dns, dhcp or software packages etc. all that is managed by pfsense running as a vm. The only change that happened at the new site was I needed to change the ethernet ports assigned to the internal LAN & management network, and the ethernet port assigned to WAN. (This was because I had the LAN/mgmt port restricted to gigibit but it was a 100M switch whereas the WAN was still set to auto-negotiate) But I can’t see how that would cause a problem? The vm running MSM can ping the host with no issue. The next thing I checked was if the CIM service was running, it was not so I manually started it, but MSM still didn’t see the esxi host. I then tried your suggestion of disabling the host firewall but that has not allowed MSM to connect either. The host had been restarted several times and never before did CIM not start, I feel like changing the ports must be someone related, but I have no idea how. I will need a change window to change it back, but in the meantime I’m hoping someone has some idea for me. Everything was working great until I changed the NIC that was assigned to the vswitch attached to the management network was. CIMOM service wouldn’t start and MSM couldnt find the host. I changed back to the NIC that was originally assigned to the vswitch with the management network and rebooted and everything is working fine again. I can only assume that when installing the SMIS provider it must somehow create some sort of dependency on the NIC assigned to to used for management. Hey all, so I just followed this guide to a T, I can see the host in the list and it shows the health as optimal, however when I go to actually login it goes to the next screen and just sits there with a large grey circle spinning in the middle and never loads the details, after closing out and reopening then it doesnt discover the host for a few and then picks back up on it but is the same thing, I have verified the firewall is disabled in the host and the vm and the entries in the host file. 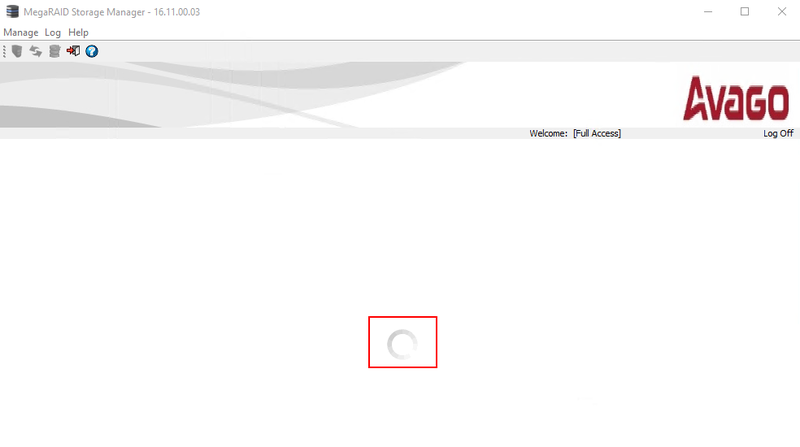 Same here…actually after login on the new screen i just see a large grey cycle that spinns arround… it doesn’t load the dashboard. Have anybody an idea? I double checked and verified it is a MegaRaid controller, but I am having the same issue you posted in the screenshot. 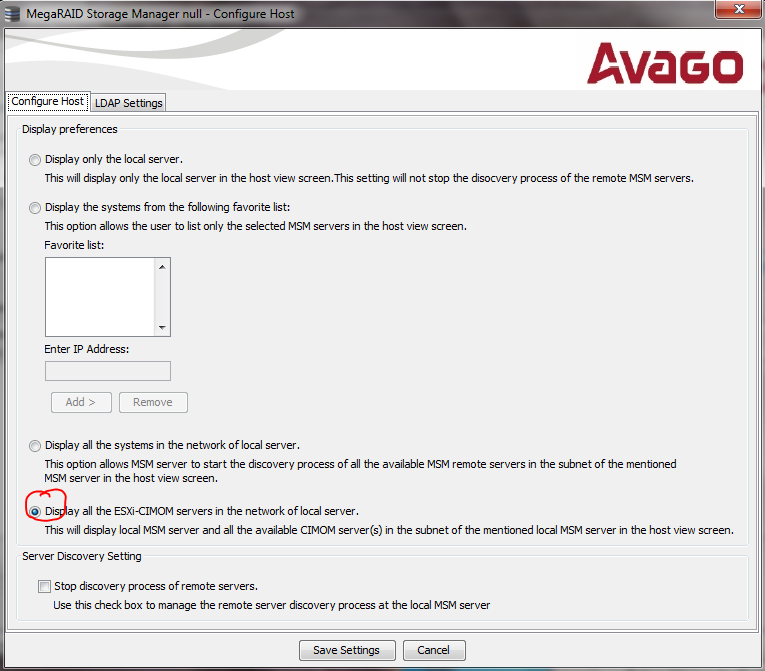 I also have people who have Avago, which is Megaraid now as well, is there a different install scenario for Avago? Sry i don’t now… but if i find a result, i am going to tell you it. I have been trying to get this to working on ESXi 6.0.0 3825889 with a 9260-4i controller. I have have walked through the instructions several times with multiple hosts and can never get the anything to come up. 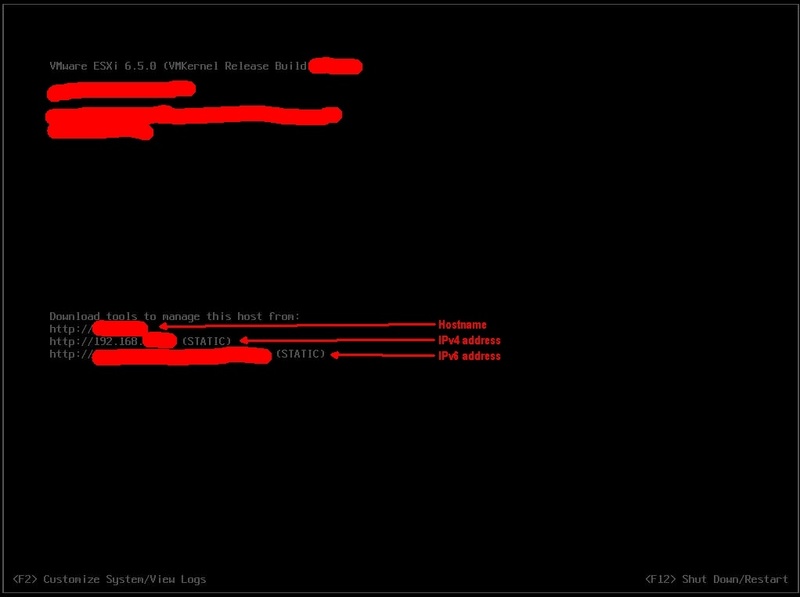 The installed VIB is: lsiprovider 500.04.V0.62-0005. Which is the lasted according to the website. I am not sure what else to try at this point. I have checked the esxi host’s webportal and dont see anything in the Hardware status related to the RAID controller. I have tried the MSM on a Windows machine on the same subnet, and it never locates anything. Any assistance would be appreciated. Thanks for creating this post. It helped me get a good start on how to administer a 9260-8i controller on an ESXi 6U3 freeware host. In my case, the server box is a repurposed HP z620. Like others, I initially had no success establishing contact with the controller on the ESXi host. Apparently this is because I had installed MSM on a Windows7 VM hosted by the same ESXi host that the controller was installed in. By chance I had the opportunity to try MSM on a Windows7 machine outside the ESXi host but on the same network. On the Windows7 machine outside the ESXi host MSM worked like a charm. There’s something about the network interaction between native VM’s and an ESXi 6U3 host that MSM doesn’t handle well. I love the detailed instructions. Followed everything precisely. Unfortunately it did not work for me. I have a slightly different configuration, tried loading the LSI MegaRAID provider on an ESXi 5.1.0, (patch 1065491) Lenovo ThinkServer TS430 with BIOS at 3.50. A prior syadmin selected and installed this server and never configured it properly (or failed as I have). I see there is a newer BIOS available from Lenovo, (and probably newer MegaRAID firmware if I bothered to search), but we cannot get the on-board remote management (which includes remote KVM) to connect and we do not have remote hands-on IT available to perform BIOS and firmware updates. A bit of a chicken-or-egg question. Everything I’ve done to try and get this crappy SOHO server to be “Enterprise” class has failed. We are moving on. The hardware is old and we have some plans for a site refresh in the near future, so until then we will continue to limp along. My take-away, if you see a Lenovo server on your horizon, run away! I just followed this guide for an ESX 6.5 installation using the latest SMSI provider for my Controller (VMW-ESX-5.5.0-lsiprovider-500.04.V0.66-0002-5751577) and after the reboot I sadly dont see any new sensors in Host->Monitor->Hardware Health (there is no Configuration->Health Status anymore). I still tried to connect with the MegaRaid Manager (Firewalls off) but no luck. I have been through this on Two Servers the past week trying to figure it out. I have installed The latest driver and the latest SMIS providers on both, and I cant get either to show in Sensors. ESX 6.5 LSI Controllers 9260 on one and 9361 on the other Supermicro MOBO’s. I can get the MSM to see it, but that’s not what I want. Had this working under ESXi 6.5 but was suffering from the dreaded memory error when making more than one edit to a VM. Finally upgraded to ESXi 6.7 and the editing error has been fixed but I can no longer get MRM to work. Anyone got it working with 6.7 yet? I have vmware 6.0 now after downgrading from 6.5, and it still won’t work. MSM just says servers could not be found because server may be down or server not installed. Hosts File/newest MSM/SMIS installed into ESXI/CIM server started, i have spend hours on this. I am willing to pay for someone to fix this. Can anyone contact me? i had the same issue like such others here. I have done all the steps above. The ESXi says that the CIM Server is installed. good. First i logged in to the webinterface and shown the services. CIM Server ist not automaticly active after installation and reboot. So I activated the CIM Server Service but The MSM still can’t discover my ESXi CIM Server. I deactivated the Firewall on ESXI and on my Client with MSM. no discover possible. Last step i checked the host file again and i found the Problem. It ist very important that the host name was right.